I am trying a bit of a variation on my old technique because nails are no longer easy to find in great variety. With the old loose nail bins you could look through them and find exactly what you need. Todays product is much less varied and usually sold in sealed boxes making the nails difficult to inspect. 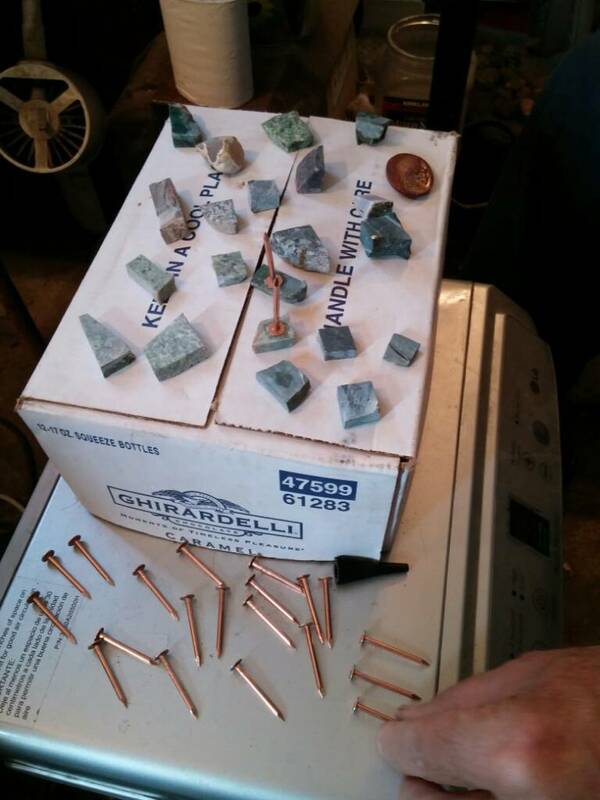 The nails I am using here are copper covered steel nails for flashing or stone roof tiles. 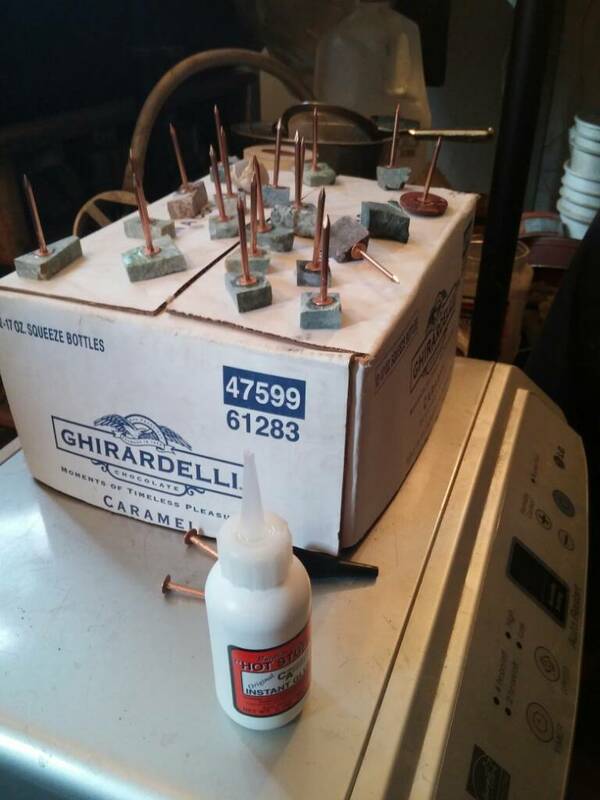 They are hard to make rust and they have flat accurate heads that are more perpendicular to the shank than most nails and they have no raised pattern on the heads.I grind the points down to make them safer to use.I did not have a medium viscosity or gel superglue which is preferable so I used the thin formula which may not work well in this application. 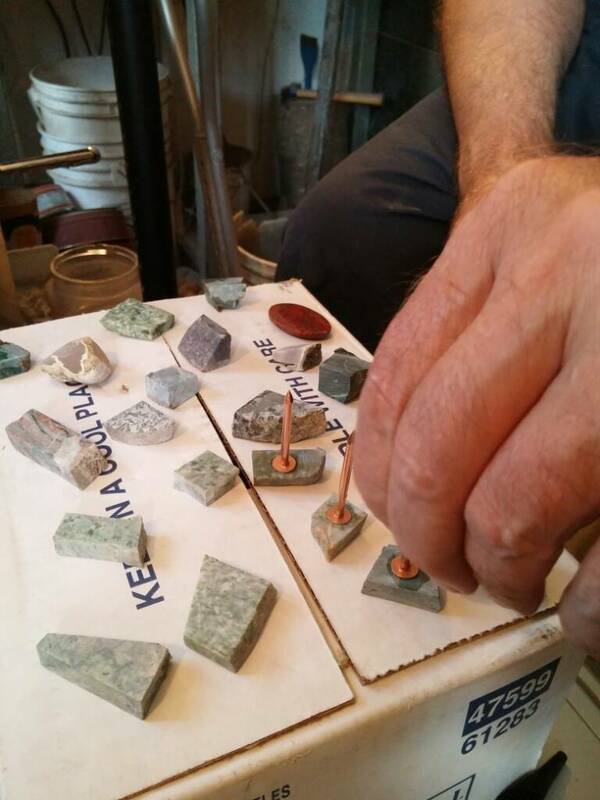 We cleaned the nails with a solvent as we did the surface of the stone to be glued. 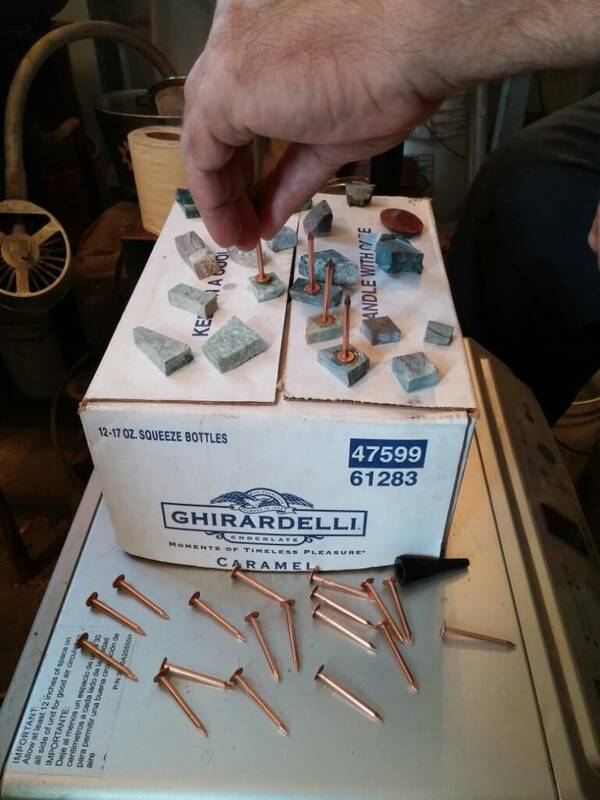 Some nails , especially sinkers , can be coated with plastic and are not acceptable with any of these methods which use heat and/or solvents.A small amount of glue is placed on the stone and the nail head placed in your preferred location. The thinner the glue the faster it sets. After they are all affixed I spray them with accelerator to quicken the final glue bond. How many will pop off? We will let you know. One pic of between 200 and 400, and another pic of dopped and waiting. the cork is only added one at a time as needed while working. I have a soft spot in my heart for these copper nails as I have used them a lot and find them comforting in some odd way. The backs of the cabs were prepared by grinding the slightest dome on the back then sanding them on the 220 soft wheel. They were wiped with alcohol and when it was dry dopped using super glue. We used an accelerator sprayed from about ten inches away to insure a hardened glue.Be careful of the fumes from both the super glue and especially the accelerator.